Now in its third season, the 40 member orchestra performs in a 500-seat, intimate acoustical tent pavilion on the campus of Sierra Nevada College, in Incline Village, Nev. Audience members are reminded of their unique setting as they enter the tent nestled under hundred year old towering trees and within a half mile of the Lake Tahoe shore. For the individual musicians who travel to Tahoe, the festival is the ultimate summer camp. Their home symphonies include some of the most prestigious orchestras in the world — the Metropolitan Opera Orchestra, the Los Angeles Philharmonic, the symphonies of San Francisco, Seattle, and Vancouver, among others. Lake Tahoe SummerFest Artistic Director and Conductor Joel Revzen has conducted and recorded symphonies and operas throughout the world, including with the London Symphony, the Mariinsky Orchestra, (formerly the Kirov), Scottish Chamber Orchestra And the Moscow Symphony. He is currently in his ninth season on the conducting staff of the Metropolitan Opera in New York. Repertoire highlights this season include Beethoven’s 4th Symphony; the rarely-heard gem Britten’s Serenade for tenor, horn and strings; Mozart Symphony No. 40; Beethoven Piano Concerto No. 2; Strauss Concertino for clarinet, bassoon, strings and harp; a newly-orchestrated Concerto for timpani and orchestra; and Mendelssohn’s ‘Scottish’ Symphony. Connection between the audience and musicians has always been central to the SummerFest performances, and that will be served by two new additions to the season. “Meet the Music/Meet the Musicians” Sunday concerts will bring intimacy and electricity between the artists and audiences as the musicians explore weekly themes based on the great classical music centers of Europe – Vienna, Paris and London. The Lake Tahoe SummerFest season begins Friday, Aug. 1, 2014 with the opening concert in the acoustically designed concert tent on the grounds of the Sierra Nevada College: 999 Tahoe Boulevard, Incline Village, Nev. For tickets and season subscriptions information go to www.tahoesummerfest.org. Wanderlust, a yoga and music platform, announced it is opening a permanent facility in Lake Tahoe, California with the first yoga studio to hit the Squaw Valley Resort. The new studio, Wanderlust Yoga Squaw Valley, is the third for Wanderlust and is an extension of the longstanding partnership between Wanderlust and Squaw Valley. Squaw was the original birthplace of the Wanderlust festival, which has now expanded to seven locations around the world. Wanderlust Yoga Squaw Valley will be the only full-time yoga studio in the valley, and is slated to open on Frist Street in the Village at Squaw Valley in late June 2013. The studio plans to open six days a week with a variety of classes including Hatha, Vinyasa and Iyengar– ranging from beginner through high-level instructor training. Unique to Squaw, some classes will incorporate its extraordinary landscape, taking the practice outside on the mountain as well as classes that will start in the studio and wrap-up with a hike, bike ride, run, swim in Lake Tahoe or, come winter, skiing and riding on the mountain. Squaw’s partnership with Wanderlust means the studio will be able to offer classes taught by some of the most recognized yoga instructors both regionally and nationally. Wanderlust and Squaw Valley will also be working together to host several two to three day retreats incorporating yoga, activities and accommodations. In the style of the Wanderlust Festival’s vibrant fusion of yoga and music, Squaw’s new Wanderlust yoga studio will feature a full sound system to be used for some yoga sessions as well as for monthly live music in the studio. Wanderlust Yoga Squaw Valley will host its grand opening party during this summer’s Wanderlust Festival, coming to Squaw Valley July 18-21. The Wanderlust Yoga Squaw Valley studio is the third of three Wanderlust yoga studios. The first opened in Austin in spring 2012, followed by a studio in Montreal in early 2013. Wanderlust Festival, LLC is a producer of large-scale lifestyle festival events focusing on yoga, music and wellness. Its flagship festival, Wanderlust, was first launched in California in 2009 and has already become the largest multi-day yoga event in the world as well as a significant player in the larger US festival market. The company was founded in 2009 as a joint venture between Velour Music Group, an artist management company and event producer based in New York City, C3 Presents and Starr Hill Presents, event producers responsible for the top music festival brands in the country, including Austin City Limits Festival, Lollapalooza, Bonnaroo and Outside Lands. For more information, visit www.wanderlustfestival.com. Become a fan of Wanderlust at www.facebook.com/wanderlust and follow Wanderlust on Twitter at www.twitter.com/wanderlustfest. Host of the 1960 Winter Olympics, Squaw Valley is internationally renowned for legendary terrain that spans 3,600 skiable acres, six peaks and 30 chairlifts, and ranges from an expansive mountaintop beginner area to unrivaled expert steeps, trees and bowls. Off the mountain, families relax in The Village at Squaw Valley around the cozy fire pits or enjoy a host of restaurants, bars, boutiques and art galleries. Guests can stay in one of The Village at Squaw Valley’s one, two or three bedroom suites, each with a fireplace, kitchen and balcony, for the ultimate slopeside lodging experience. Squaw Valley and Alpine Meadows joined forces in November 2011, bringing the two ski resorts under common ownership. Skiers and riders can access 6,000 skiable acres, 43 lifts, six terrain park and 270+ trails at Squaw and Alpine Meadows on one lift ticket or season pass. Cal Neva Resort Casino Hotel is offering a $49 room special for those in our Armed Forces. Tahoma Meadows Bed & Breakfast Cottages is giving guests a $50 voucher to use at Swiss Lakewood when they book three nights in a B&B cottage. “America’s Most Beautiful Bike Ride,” the immensely popular summer road bike ride around Lake Tahoe, is already sold out. But cyclists can circumnavigate the lake on their own, and for free, this spring, taking advantage of the spring shoulder season that means less traffic at Lake Tahoe and perfect weather for a long road ride. Hop on the road bike and pedal one of the world’s most scenic bike rides — a ride that gives you an open-air, front-row seat to some of the nation’s most stunning scenery, like the aquamarine waters North Tahoe’s east shore. The 72-mile ride is perfect for strong, recreational cyclists. Cyclists can take it slow by stopping at a lakefront restaurant for lunch or lounging on one of North Tahoe’s beaches as a rest stop. North Lake Tahoe’s clear waters are internationally famous, but most visitors experience Big Blue during the height of summer, when the lake’s clarity is not at its apex. In spring and early summer, North Tahoe still retains much of the winter’s stunning, gin-clear clarity, while the warming weather makes it comfortable for a lengthy paddle. Remember North Tahoe’s waters are still very cold, and only confident paddlers should venture well out into the lake. But even novice paddle boarders can hug the shoreline, and enjoy a paddle backdropped by snowcapped peaks, over shimmering, translucent waters. Spring and early summer is the secret mountain bike season in North Tahoe. The trails are dust-free and grippy, and the meadows are lit up in iridescent green. While much of the Tahoe Rim Trail might still be under snow, low-elevation trails and south and west facing trails are primed for mountain biking. The world-class Flume Trail on North Tahoe’s east shore is melted out, and trails around Truckee, like the Emigrant Trail, are primed for early season riding. Most of North Tahoe and Truckee’s many golf courses are open for business, and in immaculate shape after a very forgiving winter. Sunny skies and snowcapped peaks make a perfect backdrop for an early summer round of golf at North Lake Tahoe courses. Enjoy the thinner crowds and greener fairways before summer’s high season ramps up. River, stream or lake — the North Tahoe area has enough fishing options to last a lifetime. Stream fishing season is now in full effect, and a day spent reeling in rainbows and browns on a tranquil section of the Truckee River is an unforgettable mountain experience. The Truckee River offers it all — slow water between Tahoe City and Alpine Meadows, and a wild trout fishery below Truckee that harbors large, wild Rainbows and Browns. Or fish for the big boys, by trolling the waters of North Tahoe, Donner Lake or Stampede Reservoir for hungry Mackinaw that can grow up to 30 pounds. Voted by USA Today readers as “America’s Best Lake,” Tahoe South visitors can expect the best this summer with warm summer days, countless adventures and entertainment venues that brim with high endurance. A powerhouse lineup of sports legends including Michael Jordan, Charles Barkley, Oscar de la Hoya, and Bodie Miller will join entertainers Ray Romano and Jack Wagner for the 24th annual American Century Championship, July 16-21, 2013. (www.TahoeCelebrityGolf.com). More than 80 of the brightest sports and entertainment stars and celebrities will tee it up at Edgewood Tahoe Golf Course, vying for the $125,000 winner’s share of the $600,000 purse. First-timers this year include NFL Hall of Famer John Randle; former NFL Pro-Bowl wide receiver Andre Reed; former NBA All-Star Detlef Schrempf and former MLB All-Star Tim Wakefield. Harrah’s Outdoor Concert Series, an annual South Shore favorite, features a star-studded lineup: Steve Miller Band, June 22; Tim McGraw, July 16; Rascal Flatts and The Band Perry, July 19; Phish, July 30-31; FUN with Tegan and Sara, Aug. 27; Brad Paisley, Aug. 30 and Dave Matthews Band, Sept. 4. Shows are anticipated to sell out. In the meantime, showroom entertainment includes: Roy Rogers & The Delta Rhythm Kings, April 27; Sammy Hagar, May 3-4; Super Diamond, May 11; Big Bad Voodoo Daddy, June 1 and Eric Burdon & The Animals, June 8. www.SouthShoreRoom.com. MontBleu Resort Casino & Spa’s Summer Concert Series second annual Lake Tahoe Reggae Festival returns on Saturday, June 29. Tahoe’s taste of island irie at the 4,000-seat outdoor amphitheater will feature breezy Jamaica rhythms and reggae ska beats from headliners SOJA and Alpha Blondy, along with special guests Passafire, Stickfigure, Tomorrow’s Bad Seed and Island of Black & White. Also added to the outdoor concert lineup are Slightly Stoopid and Atmosphere with Tribal Seeds, The Grouch and Eligh, July 18. Additional acts will be finalized soon but expect a variety of rock, reggae, hip-hop, punk, etc. In the meantime, showroom entertainment inside includes: The Shins, May 11; Edward Sharpe and The Magnetic Zeros, May 23; Gretchen Wilson, May 31; The Virgins, June 8. www.montbleuresort.com. The Valhalla Arts & Music Festival (http://valhallatahoe.com/) celebrates music and visual arts from June through fall. In its 33rd year, this event series is set against a backdrop of Lake Tahoe and the Tallac Historic Site. It features performances and comedy at the Boathouse Theater, outdoor concerts, festivals, and cultural events. Recognized by NBC’s Today Show as one of the country’s top Fourth of July weekend celebrations, Lights on the Lake fireworks show is a Tahoe South ritual that packs the shoreline with spectators. The best viewing spots are South Shore’s sandy beaches or aboard the M.S. Dixie II or Tahoe Queen paddlewheelers. An end-of-summer fireworks display will grip the skies over Tahoe South again Labor Day weekend. Both displays feature simultaneous music set to sky rockets on local radio stations KRLT-FM 93.9 and KOWL-AM 1490. Hot August Nights South Lake Tahoe Experience returns for its fourth year, Aug. 2-3, at MontBleu. Car lovers can slide behind the wheel and cruise through four straight days and nights of show-n-shines, car exhibits, exclusive car auctions, and an outdoor pavilion with food, beverages and great oldies music. The 24th annual (www.lakeintheskyairshow.com) Lake in the Sky Air Show takes flight, Aug. 23-25, and features some of the world’s top aircraft performers, radio-controlled demonstrations and military aircraft. Labor Day weekend also features the 4th annual (www.samplethesierra.com) Sample the Sierra, a farm-to-fork festival, Sept. 1. This event offers regional products such as honey, jams, olive oil and soaps along with pottery, painting, photography and handmade crafts by regional artists. The festival brings live entertainment, storytellers and acoustic music as well as tastings of local produce paired with beverages from Sierra Nevada wineries and breweries. The 21st (http://www.valhallafaire.com) Valhalla Renaissance Faire, June 1-2 and 8-9, will exhibit the pleasures and pageantry of the Elizabethan era. Costumed players perform at Camp Richardson Resort in the shady lanes and byways, and sell their wares from market stalls filled with fine handmade crafts. During the 22nd annual (http://www.bikethewest.com) America’s Most Beautiful Bike Ride, participants pedal the 72-mile circumference of Lake Tahoe, June 2. This ride promotes Lake Tahoe Bikeway, a plan to build and interconnect bike lanes/trails around Lake Tahoe. Rounding out summer will be the Tour de Tahoe — Bike Big Blue Ride to Cure Diabetes, Sept. 8. World class paddlers strike out from El Dorado Beach, June 29-30, for the nation’s premier flat-water standup paddleboard competition, Race the Lake of the Sky (http://racethelakeofthesky.com/). Multiple races are offered including short course, long distance, team relay, grom races plus a new SUP Cross Sprint course. Vendors, food booths and music are available throughout the weekend. Runners will take to the woods around Sierra-at-Tahoe Ski Resort this summer for the Ragnar Trail Relays, July 26-27. (http://ragnartrail.com/) This overnight running and camping race pits eight- and four-person teams as contestants charge around three loops that range from four to eight miles long. One of the largest gatherings of unique boats in Northern California is the South Tahoe Wooden Boat Classic, July 26-27, at Tahoe Keys Marina & Yacht Club (http://www.tahoewoodenboats.com). Enthusiasts can get an up close look at the vessels, talk with their owners and hear the powerful roar behind straight V6, V8 and V12 engines. From the early 1900s to the fiberglass vessels of the 1960s, enthusiasts can see more than 65 wooden antique and classic boats in the water and eight race boats on their trailers. The Valhalla Grand Lawn is also the site of the annual Wa She Shu It Deh Native American Arts Festival, July 27-28, a cultural gathering that features traditional American Indian dancers and drummers, basket weaving displays, art and great food. The third Tahoe Show (http://www.tahoeshow.com/) body building and sculpting competition at MontBleu Resort Casino & Spa is set for Aug. 24, and will bring hundreds of the area’s fittest to compete for cash prizes in a judged competition featuring bodybuilding, figure and physique, fitness and bikini. Return to the 1920s and enjoy the (http://www.tahoeheritage.org) 28th annual Great Gatsby Festival on the Pope Estate at the Tallac Historic Site, Aug. 10-11. Visitors will find antiques, Roaring ’20s era costumes, live music, interactive historic house tours, vintage auto rides, ice cream, cotton candy and vintage kid’s games. Run, walk, swim, paddle, peddle or golf, Sept. 27-29, during one of the many (http://www.laketahoemarathon.com) Lake Tahoe Marathon events. Both the half and full marathons are along the west shore of Lake Tahoe and feature challenging hills around Emerald Bay. For real time updates on events, promotions, packages, conditions and events in Tahoe South, The Lake Tahoe Visitors Authority is on Facebook: www.facebook.com/TahoeSouth, Twitter: http://www.twitter.com/TahoeSouth, YouTube: www.youtube.com/LTVA. 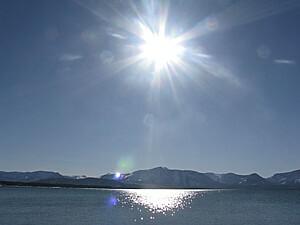 For Tahoe South information: 1-800-288-2463 or www.tahoesouth.com. With its mesmerizing blue waters, tall mountains and endless activities, Lake Tahoe is an immensely popular summer vacation destination. With so much to do, it can be hard to pinpoint exactly how to spend your time at Tahoe, but the experts at Zephyr Cove Resort, Lake Tahoe Cruises and Heavenly Mountain Resort have teamed up to develop this list of the top ten things to do at South Lake Tahoe. Take a Cruise: “You can’t go to Lake Tahoe without getting out on the lake,” says Tony Lyle, director of sales and marketing for Lake Tahoe Cruises. The lake is home to two authentic Mississippi paddlewheel boats, the M.S. Dixie II and Tahoe Queen. Both boats offer charm, entertainment and the best views of the lake with cruises to Emerald Bay, dinner cruises, and a brunch cruise on the M.S. Dixie II every Sunday morning. Go to the top of Heavenly: The best summer views of Lake Tahoe are a 12-minute, 2.4-mile ride on the Heavenly Gondola. Stepping out onto the Mid-station Observation Deck at 9,123 feet of elevation, guests will be amazed by the fabulous views of the Carson Valley, Desolation Wilderness and a rare shore-to-shore view of Lake Tahoe. From the Deck, continue the ride up the Gondola to Adventure Peak, where you can dine at Tamarack Lodge, enjoy tubing, a rock climbing wall and more than eight miles of hiking trails. Spend a day at the beach: What is a lake vacation without a day on the beach? Zephyr Cove Beach is a regular of “Best Lakes of Lake Tahoe” lists and for good reason. The long, sandy cove is ideal for sunbathing, swimming and other beach activities. Steps from the shore, you can grab a drink and bite to eat at the Sunset Bar & Grille with its fabulous views of the lake and laid-back summer ambiance. Tour Vikingsholm: This world-famous replica of a Scandinavian castle is open daily for tours throughout summer. In July and August, you can park at Eagle Point State Park and enjoy a 1.7-mile hike along Emerald Bay to Vikingsholm for added enjoyment. Rent a powerboat: Want to accelerate the fun at Lake Tahoe? Tubing, skiing and boarding behind a powerboat is a high-octane way to see Tahoe. Explore coves, inlets and far off portions of the lake quickly and efficiently with a powerboat rental from Zephyr Cove Marina. Horseback ride through the Sierras: Enjoy the area’s serenity and beauty as you amble over forested scenic trails with amazing views of the lake and surrounding mountains. One, 1.5 and two hour guided trips are available, as are breakfast, lunch and dinner rides. Call 775-588-5664 to reserve. Explore Heavenly Village: Right in the heart of South Lake Tahoe, Heavenly Village offers shopping, dining, mini-golf, a movie theatre and access to the Gondola for a splendid afternoon or evening on the town. Kayak/paddle board on the lake: While the paddlewheel boats are a great way to see much of the lake from a high vantage point, kayaking or paddle boarding is a relaxing and intimate way to see the lake up close, observing its wildlife and gentle currents from just above the surface. Rentals are available at the Zephyr Cove Marina. Go parasailing: Get airborne for a truly unique way to see Tahoe. Parasailing will lift you 1,000 feet into the air as the lake shrinks under your feet to open up stunning views and high-flying fun. Call 775-589-4901 for information and reservations. Play a game of beach volleyball: Standing upon sun-warmed sand with the lake in the background makes for an inspiring atmosphere for a game of volleyball. Zephyr Cove Resort is host to professional volleyball tournaments due to its regulation courts and breathtaking location. Court use is free and volleyballs are available from the Sunset Bar & Grille.